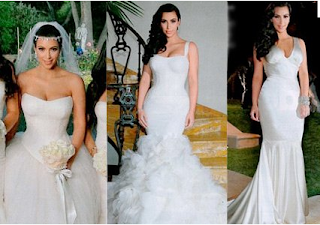 Kim Kardashian’s Wedding Day looks! 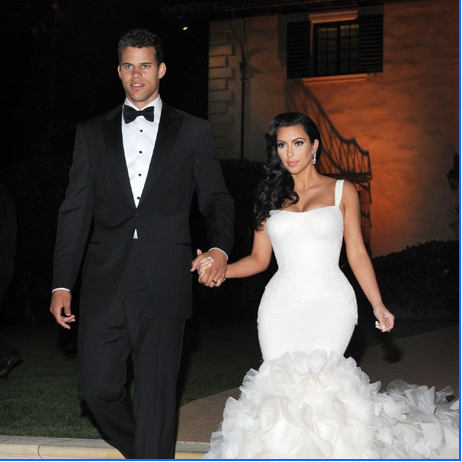 It’s the wedding so many people have been waiting to see.. Kim Kardashian married Kris Humphries! Kim is a huge style icon for this generation. I can’t tell you how many times I get brides coming in with pictures of her hairstyles. Naturally everyone had their eyes out for what Kim would wear. 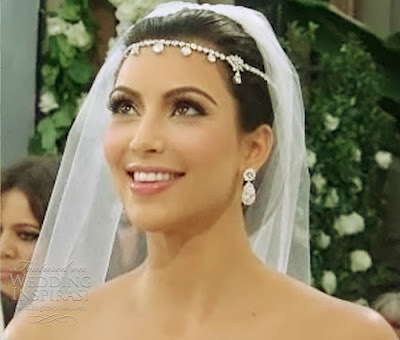 I ‘m sure there will be a wave of trending after Kim’s 3 wedding day looks. For her ceremony, Kim chose a classic ballgown. 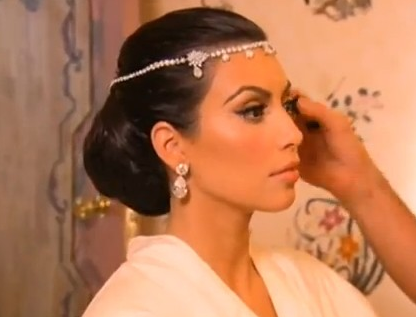 For her hairstyle, she wore a sleek chignon and jeweled band adorning her forehead ( a nod to her Armenian heritage). Not what I would’ve expected to see on her but the more I look at it, the more it suits her. Her make-up was flawless as usual. Not too overdone for the ceremony. 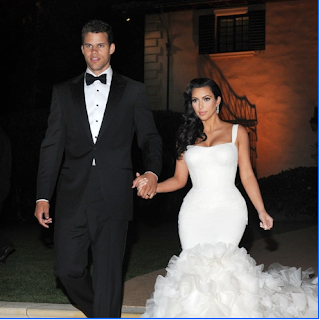 Kim was radiant in a fitted, flamenco style dress that really showed off her curves. She let down her hair to reveal glossy, polished waves and vintage side part. 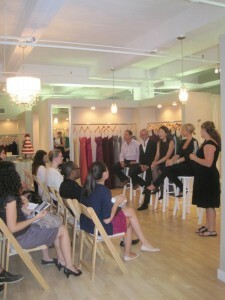 Her last look was my personal favorite (seen below, third to the right). She looked like a 1950’s Hollywood star! She chose an off-white satin, mermaid style gown. Her coveted long waves were still in a side part, but for this look she added a beautiful antique-looking jeweled piece. It added just the right touch of glamour. I must add that I love the contrast of her almost black hair with the white of her dresses. Dark hair may also be a growing trend for some brides. So it may not be feasible for most of us to indulge in three wedding day looks from dresses to tresses but you can go for a different reception look without getting a whole new outfit. Just take us with you! 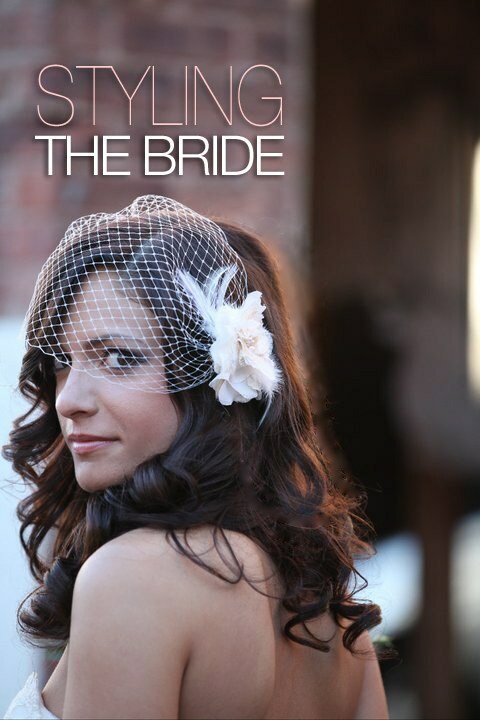 Styling the Bride is now offering packages that offer services extending after your all done getting ready. It’s like having your own personal beauty assistant for the day! We have half-day (through the ceremony and pre-reception photos) and whole-day packages (through the reception). If you book either of these packages, a change of hairstyle and make-up application is included! Check out our website or call us at 201-636-2722 to find out more! This past Monday Sept 12th we attended a great event put together by The Wedding Salon called “Bridal Bootcamp” at Jenny Yoo’s bridal boutique in Manhattan (BTW ladies, she has amazing bridesmaid dresses if you’re still looking). 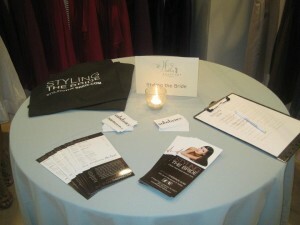 We had the chance to meet some newly engaged couples and other vendors in the bridal industry. What I loved about this event was that it gave each vendor a chance to talk about it’s respective field and the role it plays in the world of weddings. 2. Tips and trends in your industry? 3. How to save on your wedding? Naturally I was a bit nervous speaking in front of a crowd but I realized that these brides were intently listening and seeking advice. Styling The Bride is the bridal department of Substance Salon that specializes only in bridal hair and make-up. When you come in for your trial, you will be greeted by our welcoming staff and a glass of champagne! Whatever your vision for the day of your wedding, our stylists will be intuitive to your needs while giving you professional suggestions to look your best. You can try several styles during your trial as we book plenty of time for your appointment. 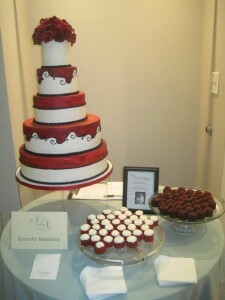 For “wedding day” services we offer in-salon as well as off-premise services for your convenience. We’ll travel to your choice of location, anywhere in the tri-state area. If you’ll be getting ready in the salon, you’ll enjoy a complimentary continental breakfast and Mimosas! We are finding that many brides are looking for the softer look. Romantic is in! Following the trends of bridal gowns, hair and make-up is looking much more vintage and lady-like. Glossy waves, faux bobs and birdcage veils are all the rage. Hair accessories are white-hot right now. Jewels, feathers or flowers make your style pop. Even the most simple hairstyle can be dramatized with a beautiful hair accessory. 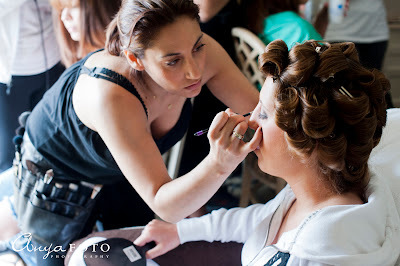 Some tips that I have for brides are to always, always have a hair & make-up trial 2-3 months prior to your wedding. You don’t want to take any chances on the day of your wedding. Also, keep an open mind at your trial. You may love something that you’ve never even considered. If you’re looking to save a little money, you can come in for your trial when you have an event to go to, like your bridal shower, engagement shoot, or another wedding. This way you have a reason to be dolled up and you get to have your trial all in one day. If you’re worried about others seeing your wedding day look, we can always alter it before you leave so that no one gets a sneak peek!